As a mom or dad, you already know that the first year of your baby’s life is a year of incredible growth and development. 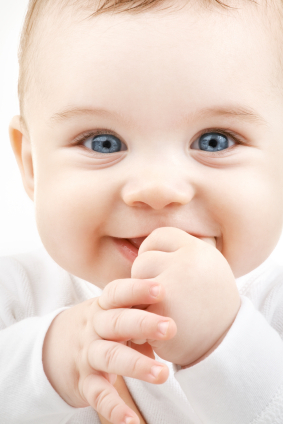 The average baby triples his birthweight by age 1, and grows an incredible 10 inches in that first year. And that’s not all — between birth and 12 months, your baby will learn to roll over, sit up, creep and crawl, and perhaps even walk. 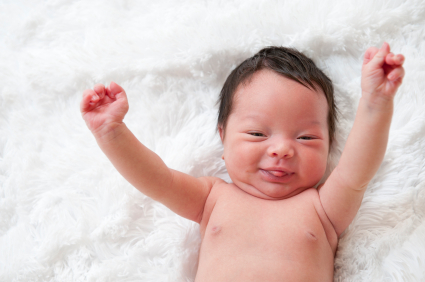 Your baby’s sleep patterns will change pretty significantly in the first year, too. And that’s what we’re exploring in today’s blog article: how our babies’ sleep needs and patterns change in the first 12 months of life. By 4-6 weeks of age, newborns need more like 14-16 hours of sleep each day. By 8 weeks of age, some (although not all!) babies will start to sleep for shorter periods during the day and slightly longer periods at night (although babies will still wake multiple times each night for feedings). While these sleeping patterns are exhausting for us parents, rest assured that they’re quite normal — and necessary — for newborns. Remember that while there are steps we parents can take to improve sleep during the newborn stage, and to help our newborns establish healthy sleep habits, it’s far too early to expect our newborns to stick to a strict sleep and feeding schedule, or to sleep straight through the night without feedings. That will come later. By 3 or 4 months of age, your baby is officially out of the newborn stage, and you may notice that your little one’s sleep is slowly starting to organize itself into shorter daytime naps and longer periods of night sleep (although again — not all babies do this by 3 months.) If your baby starts to naturally create her own schedule, then roll with it! If not, though, don’t worry — she’ll be ready in another few months. Naps may become more clearly defined at this point. 4 month olds need about 5 naps during the day; 6 month olds need more like 3 or 4 naps each day. Don’t worry if these naps don’t happen at the same times each day. Some babies this age will nap very predictably, but others won’t until later. While some babies will start to sleep through the night by this point, others won’t, and that’s perfectly okay. Many 6 month olds still need 1 – 2 nighttime feedings. However, by 6 months of age, your baby should be sleeping for longer stretches at night and shorter periods during the day. By 7 months, most babies are ready to follow a fairly predictable daytime schedule (although it doesn’t necessarily need to be a rigid one.) At 7 months, your baby will need between 2 or 3 naps during the day (that 3rd nap will probably be a catnap, if your baby is taking 3 naps). By 8 months, however, you should be able to move to two naps a day – a morning nap and an afternoon nap. Don’t forget that another sleep regression can happen during this time, and it can really disrupt sleep. The sleep regression that happens around 8 or 9 months is mostly due to all the physical development your baby is experiencing around this time — learning to crawl, pull up to standing, cruise, and perhaps even take steps! While this kind of development is so exciting to watch, it can definitely interfere with sleep. While one night feeding is still considered normal at this point, we usually recommend an attempt to night wean around 9 months. This will help you determine whether your baby still needs one feeding at night (which may be the case), or if your baby is waking more out of habit, and less out of a real need to eat. By this age, most babies are sleeping through the night and feeding only during the day (although some babies will continue to need one night feeding up to 12 months.) Most babies are taking two naps per day by 10 months. While most people assume that babies transition to needing just one nap per day around 12 months, this is actually a misconception. 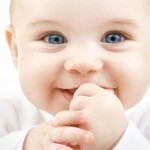 Most babies aren’t ready to make that transition until somewhere between 15 – 18 months. At this point, if your baby still doesn’t have a predictable daytime schedule in place, work to create one. This will help ensure that your baby is getting enough sleep, and that her sleep is organized well (i.e. she’s getting enough naptime sleep, but not so much that it affects her nighttime sleep amounts). Speaking of predictable schedules — be sure that your baby’s schedule includes a consistent bedtime. Consistent bedtimes are a key component of a good daily schedule. There’s also evidence to suggest that creating a habit at an early age of going to bed at the same time each night may benefit our children when they’re a little older. School-aged children who go to bed at the same time each night may be better behaved and may perform better in school. 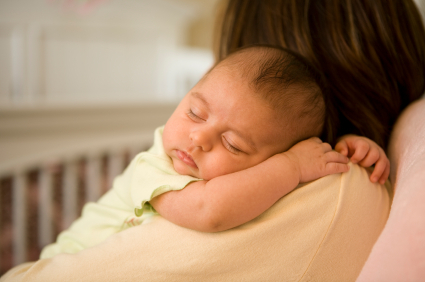 How have you noticed your baby’s sleep schedules and patterns change over time? How have you adapted to these changes? Is your baby’s changing sleep schedule proving to be more than you can handle? Please be sure to pick up your FREE copy of 5 (tear-free) Ways to Help Your Child Sleep Through the Night, our e-Book with tear-free tips to help your baby sleep better. For those persistent nighttime struggles, check out The 3-Step System to Help Your Baby Sleep (babies) or The 5-Step System to Better Toddler Sleep (toddlers). Using a unique approach and practical tools for success, our e-books help you and your baby sleep through the night and nap better. Or, join our Members Area packed with exclusive content and resources: e-Books, assessments, detailed case studies, expert advice, peer support, and teleseminars. It actually costs less to join than buying products separately! For those looking for a more customized solution for your unique situation with support along the way, please consider one-on-one baby and toddler sleep consultations, where you will receive a Personalized Sleep Plan™ you can feel good about! Sometimes it’s not that you can’t make a plan. Sometimes you’re just too tired to. I need to move her towards a 730pm bedtime. I started waking her early 745,730,715. Now she’s waking before 645am and went from 3 naps (1) 1.25 hr (2) 30 min; now she needs 4 naps again! Biologically- 830 was her innate bedtime and I’ve gradually been working towards it being 730. She is NOT an adaptive child. To go from 3 naps back to 4??? Hi @Kathe, thank you for stopping by the Baby Sleep Site! I am sorry you are experiencing issues with your daughter’s early wakings. It does sound like the shift in schedule may have changed too much for her and she isn’t adjusting too well yet. We generally wouldn’t consider anything after 6 pm early, but since you mentioned she tends to be a late riser, that is quite early. I hope this helps and her sleep evens out soon. If not, let us know, we would be happy to help you further. Thank you! Great, thanks so much! I will definitely check out the ebook. @ Megan — I’d say yes. Having a consistent bedtime and a consistent morning wake-up time is pretty key in establishing a daytime sleep and feeding schedule. Those two ‘fixed points’ are the first ones we encourage parents to work on. As for why there’s a variance in your son’s morning wake times: I’d say this isn’t abnormal, or unusual, for babies who still wake to eat at night. Things like age, development, illness, teething, growth spurts, etc. affect overall sleep amounts and can cause changes in sleep patterns. Should I be waking my 6 month old son up in the morning? I’m not sure how else to get him getting up at a consistent time. Some days he wakes to eat at 5:30 but then sleeps until 8, and other days he wakes up at 6:45 for the day. I put him to bed within the same 15 minute window every night, so I’m not sure what accounts for the difference in waking times.